This serie of products allows to integrate a PROFIBUS network with Ethernet net. On Ethernet side, it is possible to use Modbus TCP protocol or generic Ethernet communication. The HD67563 is a PROFIBUS Slave / Ethernet Converter and it allows you to connect a PROFIBUS Master net with an Ethernet net (for example a PC, Supervisory System...) in order to exchange the informations between the networks. 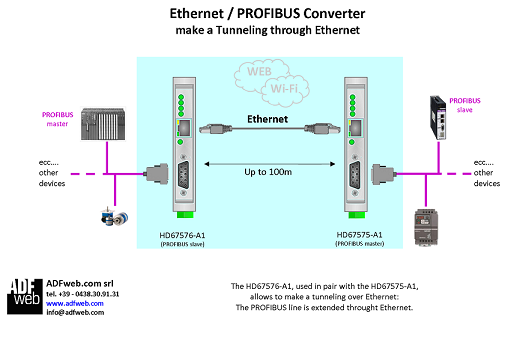 The HD67575 is a PROFIBUS Master / Ethernet Converter and it allows you to connect some PROFIBUS devices with an Ethernet net (for example a PC, Supervisory System...) in order to exchange the informations between the networks. The HD67576-A1 coupled to the device HD67575-A1 is used to extend a line PROFIBUS through Ethernet. The HD67564 is a PROFIBUS Slave / Modbus TCP Master Converter and it allows you to connect a PROFIBUS Master net with some Modbus TCP slaves. 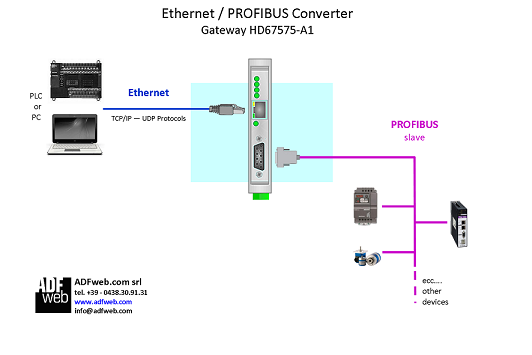 The HD67565 is a PROFIBUS Slave / Modbus TCP Slave Converter and it allows you to connect a PROFIBUS Master net with a Mobus TCP Master net (for example a PLC, SCADA System...) in order to exchange the informations between the networks. 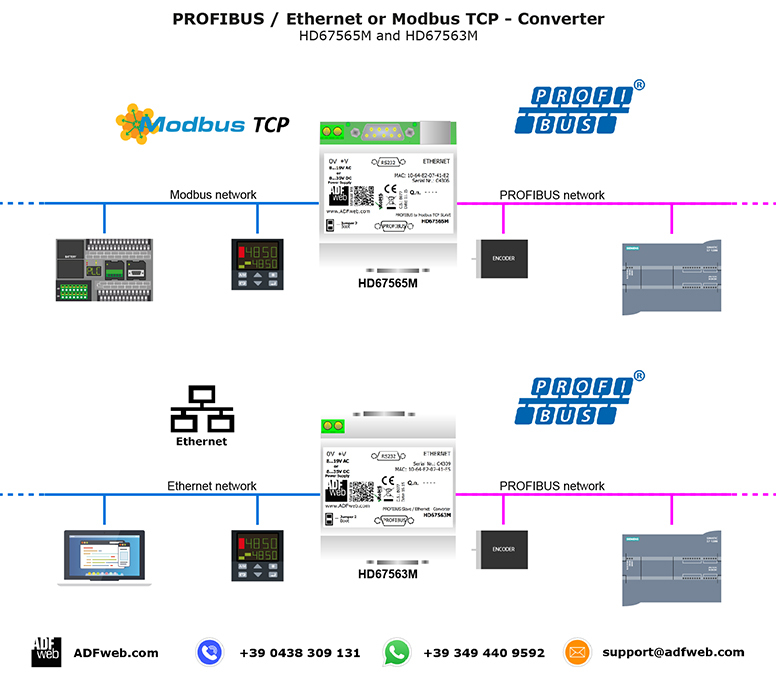 The HD67579 is a PROFIBUS Master / Modbus TCP Slave Converter and it allows you to connect some PROFIBUS devices with a Modbus TCP Master net (for example a PLC, SCADA System...) in order to exchange the informations between the networks. They are available in two Housing types: Type A and Type M (see "View" below).